Summer is coming up and what better DIY then a touch of crochet blouse. This is as simple as they get and all it requires is a tank and a thrifted doily. Pin the doily on the front of the shirt. I got mine thrifted, it was a rectangle table runner. I like the look of the rectangular shape rather than a typical circle doily to looking "crafty." 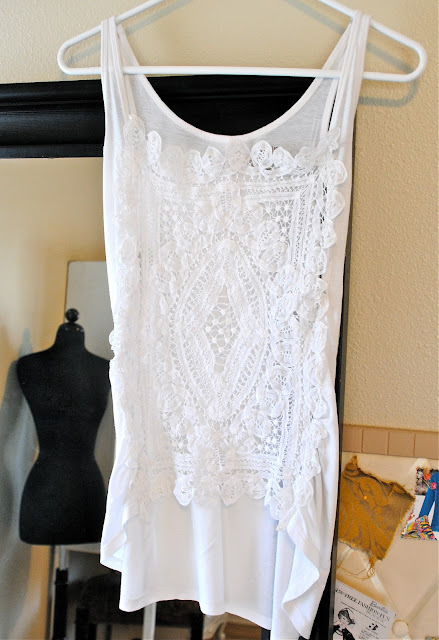 If the shirt is tight, cut it in half first and sew the doily on the cut seams. Top stitch on the shirt. I gathered the bottom since the shirt was longer then the doily...that way it is long in the back still. See the gathered pleats? Do this by folding/sewing pleats near the end so it matches up to the doily. Then cut the front piece off so the front is sheer. LOVE IT - What a cute and easy DIY - going to ebay now to try and find a doily! I bet it would be amazing dyed as well. Thank you. I think you have the right idea - looked online at ebay, and event he inexpensive doilies are more than what you would pay at a thrift store. Now I just have to find the time to go thrifting! this is so cute. especially for summer! u are so talented! thanks lady...perfect for the warm weather! a post like this makes me regret the fact that i can't sew! what an amazing idea! its so pretty! Just so you know, that isn't crochet, it's Battenburg Lace. Your idea is great and has endless possibilities! What. A great gift idea Thanks. what a great idea!! you are so inventive, doilies will never be the same! omggg, lace is just amazing! I love the idea! Get free amazon gift card codes online from here within minute.